Rental City | How a simple derby truck can save lives! You can be a part of the fight! Home / Individual Store Locations / Lindsay / How a simple derby truck can save lives! We are proud to be supporting a derby truck entered in the Fall Brawl (Lindsay Derby) on October 22nd, 2016. 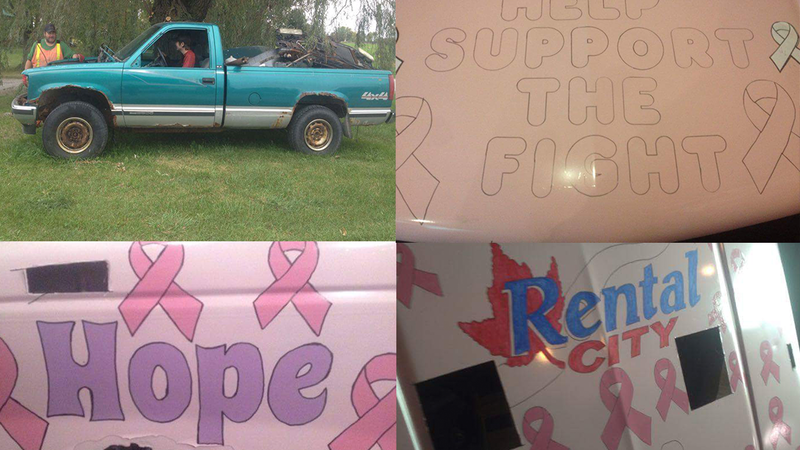 This truck is supporting the fight against breast cancer and is honouring the memory of local derby driver Paula Grills. Codie Nesbitt will drive the truck. We will have the truck on display Thursday October 20th, at our new location in Lindsay at 35 Russell St. W. (corner of Russell and William). For a donation, you can sign one of the ribbons right on the truck! All donations are going straight to the Canadian Breast Cancer Foundation. Come sign the truck and take part in our birthday bash too! For more information on the derby please visit our friends at Impact Motor Sports. For more information on the Canadian Breast Cancer Foundation, please click here. You won’t want to miss out on the fun! **OCT 20 UPDATE** Due to the weather, the truck is unable to make it on location today. We will still accept donations for the Canadian Breast Cancer Foundation. See the truck live on the 22nd at the Fall Brawl!